Have your baby look adorable and lovable when they sleep with this gorgeous baby blanket. Crochet it in your little one’s favorite colors and this will become an easy favorite. This cute and fun baby blanket will keep your little one warm and comfortable. The designer gave instruction in this FREE crochet pattern to make this in one size. The finished size of this crocheted baby blanket with lion applique is a square of 36 inches. In metric measurements, the finished size coverts to a square of approx. 91.4 cm. Kate from Kate’s Stitches created the design for this charming crocheted blanket. Access the pattern for this fun-looking crocheted baby blanket from her website for FREE. 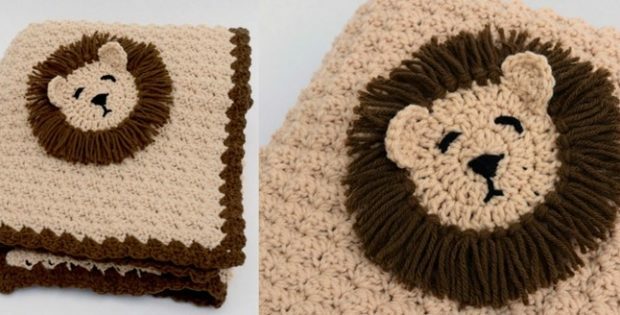 To access the FREE pattern for this cute Lion crocheted baby blanket, pleas click this link: Lion Blanket Pattern. Featured images: Kate Sitches – thank you!